Go to original pattern for design DROPS Baby 13-2. 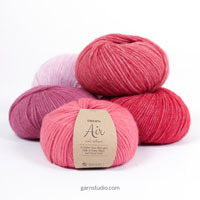 You can get the yarn to make this pattern from	8.05£. Read more. Knitting tension: 26 sts x 52 rows on needles size 2.5mm in garter sts = 10 x 10 cm. 33 sts x 34 rows on needles size 2.5mm in pattern = 10 x 10 cm. Pattern: See diagram M.1. The diagram shows the pattern from the right side. Note! The last buttonhole will be on the neck edge. Decreasing tips (applies to raglan): All decreases are done from the right side. Dec as follows in each transition between sleeve and body pieces (begin 3 sts before marking thread): K2 tog, K2 (marking thread is between these 2 sts), slip 1 st as if to knit, K1, psso. 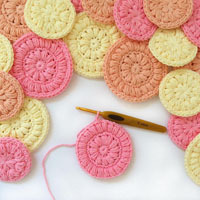 Back and front piece: knit back and forth on circular needle – read the whole section before knitting it! Cast on 163-181-199 (223-241) sts (incl 5 edge sts each side = mid front, knitted in garter sts throughout) using ice blue and needle size 2.5mm. Knit 4 rows garter sts (1st row = right side). Knit next row as follows from right side: 5 edge sts in garter sts, M.1A over the next 150-168-186 (210-228) sts, M.1B (= 3 sts) and finish with 5 edge sts in garter sts. Continue pattern. When piece measures approx 15-16-19 (22-24) cm – adjust so that next row is from the wrong side and after 2 rows in stocking sts following 1 row with holes – knit 3 rows garter sts over all sts (remember buttonhole on right front piece – see explanation above.). At the same time, on 2nd row of garter sts dec evenly on row to 130-146-160 (176-192) sts – do not dec over the front band sts. Knit next row as follows from the right side: Knit 31-35-38 (41-45) sts (= right front piece), cast off 8-8-8 (10-10) sts for armhole, knit 52-60-68 (74-82) (= back piece), cast off 8-8-8 (10-10) sts for armhole, and knit remaining 31-35-38 (41-45) sts (= left front piece). Put the piece aside and knit the sleeves. 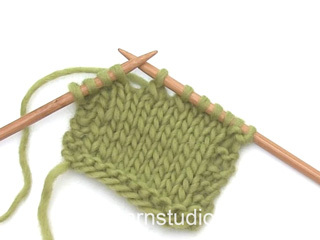 Sleeve: knitted round on double pointed needles. 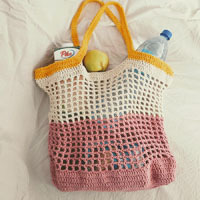 = 66-72-78 (84-90) sts – incorporate new sts in pattern as you go along, i.e. purl the first 3 inc sts, knit the 3 next etc. When piece measures approx 16-18-20 (24-28) cm - adjust to after 2 rows in stocking sts following 1 row with holes – purl 1 round. Now knit 1 round whilst dec evenly to 52-56-62 (68-72) sts. Purl 1 round and knit 1 round, at the same time casting off 8-8-8- (10-10) sts mid under arm = 44-48-54 (58-62) sts left on round. Put the piece aside and knit the other sleeve. 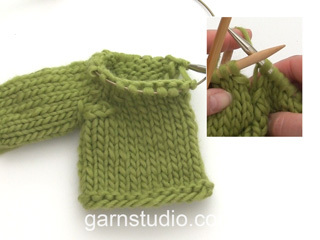 Yoke: Put sleeves in on the same circular needle as body pieces where you cast off the armhole = 202-226-252 (272-296) sts. Insert a marking thread in all transitions between sleeves and body pieces = marking 4 threads. Read all of the following section before knitting it! Knit back and forth circular needle over all sts – remember buttonhole on right front band, see explanation above. Raglan decreases: knit 1 row from the wrong side over all sts before starting the decreases. Dec 1 st on each side of all marking threads (= 8 dec per row) – see Decreasing tips! Dec on every 4th row: 9 times and then on every other row: 4-6-9 (9-11) times. Neck: At the same time, when piece measures 22-24-28 (31-34) cm put the 8-10-10 (13-15) sts towards mid front on each side on a thread for neck. Now dec to shape the neckline on every other row: 2 sts 2 times, 1 st 3 times. When all dec for raglan and neck are complete there are 68-72-74 (88-92) sts left on row and piece measures approx 27-29-33 (37-40) cm. Neck: Pick up approx 96 to 138 sts round the neck (incl sts on thread) with ice blue and needle size 2.5mm. Knit 1 row from the wrong side. Knit 1 row from the right side whilst dec evenly on row to 79-79-85 (91-97) sts (do not inc over the front band sts). At the same time, make buttonhole on right front band above the others. Continue in rib as follows (1st row = wrong side): 5 edge sts in garter sts, *K3, P3*, repeat from *-* and finish with K3 and 5 sts in garter sts. When rib measures 1.5-2 cm cast off in rib. Sew on buttons. Right leg: Cast on 52-60-64 (70-74) sts (incl 1 edge st each side) using needle size 2.5mm and ice blue mix and knit garter sts. Insert a marking thread when piece measures 4 cm (= turn-up) and measure piece from here. When piece measures 4 cm inc 1 st each side on every 1.5-2-2.5 (3-4) cm a total of 8 times = 68-76-80 (86-90) sts. When piece measures 18-21-24 (29-34) cm, cast off 2 sts each side. Now dec 1 st on one side of piece (= towards mid front) on every other row a total of 2-4-6 (10-12) times = 62-68-70 (72-74) sts. Continue in garter sts until piece measures 36-42-46 (52-58) cm from marking thread. Now knit 2 cm stocking sts and cast off loosely. Left leg: As right leg, but mirrored. 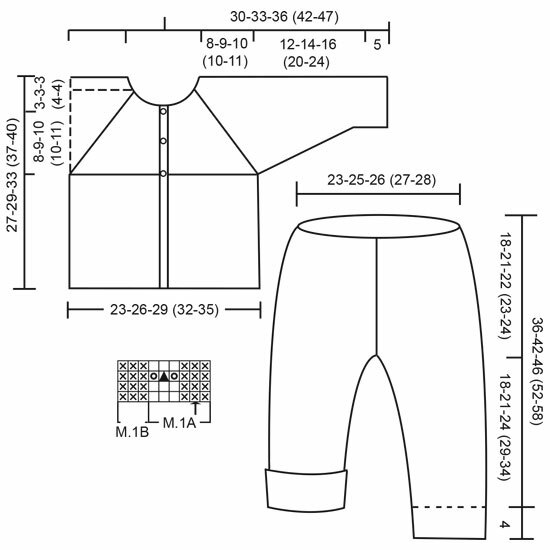 Assembly: Fold right leg double and sew inner leg seam within 1 edge st – Note! On the lower 4 cm (turn-up) sew with seam on the right side so that it doesn’t show when you turn it. Sew left leg in the same way. Sew together the trousers front and back within 1 edge st and sew the opening between the legs. Turn the 2 cm stocking sts at the top against the wrong side and attach with small, neat sts. – leave a little opening for the elastic band. Turn the turn-ups. 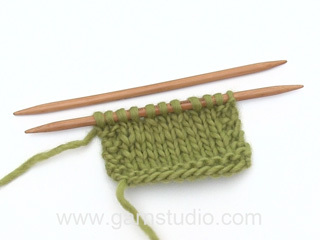 Decreasing tips: Start dec 2 sts before marking thread: Slip 1 st as if to knit, K1, psso, K2 tog. The hat is knitted round on double pointed needles. Loosely cast on 95-100-105 (110-115) sts with ice blue and needles size 2.5mm and knit garter sts – see explanation above. When piece measures 8-10-10 (12-12) cm continue in stocking sts. When piece measures 13-15-16 (18-18) cm insert 5 marking threads with 19-20-21 (22-23) sts between each. Now dec 1 st on each side of all marking threads on every other round – see Decreasing tips - until there are 15-20-15 (20-15) sts left on round. Pull a double thread through remaining sts, pull tight and attach. Fold the lower 4-5-5- (6-6) cm towards right side and attach each side with a couple of sts from the wrong side. The hat measures approx 14-15-16 (17-18) cm. 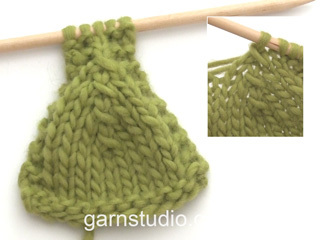 Earflaps: The earflaps are knitted from bottom up. Cast on 13 sts with ice blue and needles size 2.5mm and knit garter sts – insert a marking thread in the middle st. At the same time, after 2nd row inc on every 6th row a total of 7-7-7 (8-8) times as follows: inc 1 st each side within 1 edge st and inc 1 st on both sides of the marking thread (= 4 inc per row) by making a yo and knitting into back of yo on next row (to avoid a hole) = 41-41-41 (45-45) sts. After the last inc cast off loosely – earflap measures approx 8-8-8 (9-9) cm. Make another earflap. Fold earflaps double and sew to side and lower edge, there should be approx 11-12-12 (13-14) cm between earflaps mid front (sew earflaps on the inside of hat, 1-2 cm from lower edge so that the seam doesn’t show).